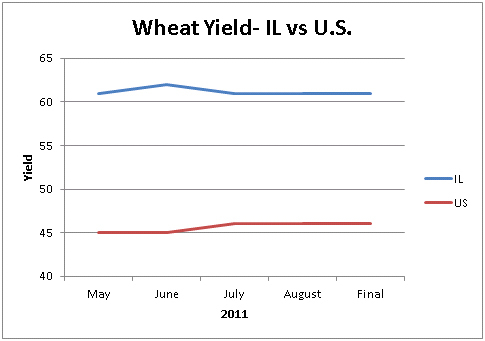 This is a presentation summary from the 2011 Illinois Farm Economics Summit (IFES) which occured December 12-16, 2011 at locations across Illinois. Summaries and MP3 podcasts of all presentations will be republished on farmdoc daily. The ‘Presentations’ section of the farmdoc site has PDF presentation slides and MP3 podcasts from all presenters here. The USDA’s National Agricultural Statistics Service (NASS) conducts hundreds of surveys every year and prepares reports covering virtually every aspect of U.S. agriculture. Production and supplies of food and fiber, prices paid and received by farmers, farm labor and wages, farm finances, chemical use, and changes in the demographics of U.S. producers are only a few examples of information in NASS reports. NASS is committed to providing timely, accurate, and useful statistics in service to U.S. agriculture. Personal information, including reported data, is protected from legal subpoena and Freedom of Information Act requests. Every person working for or in cooperation with NASS – from the Agency Administrator to the person collecting the information – signs a confidentiality form which states that no confidential information will be compromised. This includes sworn agents who are authorized by NASS to provide data collection support or statistical research. Any offender is subject to a jail term (5 years), a fine ($250,000), or both. Each March, NASS begins a cyclical process by which acreage estimates for virtually every crop grown in the US are established. This process begins with the March Prospective Plantings report. Then in June, NASS follows up with the June Acreage Report which collects data on actual plantings and harvest intentions. These planted and harvested estimates then serve as the basis from which production estimates are derived for corn, soybeans and wheat. The September and December quarterly Agricultural Surveys provide estimates of grains in storage and final yields for small grains, row crops, and hay. During the months of August through November, the agricultural community anxiously awaits the yields to be published in the NASS monthly crop production reports. NASS uses two basic methods to forecast crop yields. One method is to ask the farmer in the monthly Agricultural Yield survey. The other method is to train enumerators to count the crop in the field and use lab measurements for moisture content and shelling fraction. 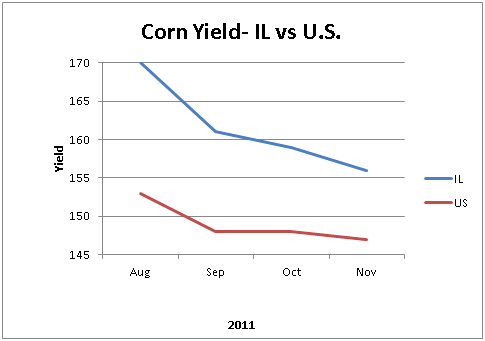 NASS statisticians use the data from both methods to establish monthly yield forecasts. In addition to these yield and production reports, NASS also compiles quarterly grain stocks reports. It is the combination of the stocks reports along with production statistics which provide the basis for the market sensitive Supply and Demand reports. NASS publishes a wide array of livestock estimates every year including cattle and calves, hogs and pigs, sheep and lambs, goats, poultry, equine, aquaculture and even many specialty species such as mink, llamas, elk, deer, bison, and rabbits to name just a few. The frequency of conducting some of these surveys will range from weekly for broilers, monthly for cattle on feed, quarterly for hogs and pigs, to once every five years for llamas. In April of each year, NASS publishes the Meat Animals Production, Disposition, and Income report. This publication contains an annual balance sheet and income estimates for cattle, hogs, and sheep. It includes estimates of beginning and ending inventories, births, deaths, cross-state movement, and marketing. Many other statistics are published by State and US. Economic surveys as defined by NASS encompass a wide range of data including the monthly Agricultural Prices Report. Each month this report presents prices received by farmers for principal crops, livestock, and livestock products; indexes of prices received by farmers; parity prices; prices paid for input items and feeder livestock; indexes of prices paid by farmers; and livestock/poultry feed price rations. NASS, in cooperation with the Economic Research Service, also conducts the Agricultural Resource Management Surveys (ARMS). These surveys measure commodity production practices and the economic status of farms around the country. Results of these surveys are used to assess the economic health of farms by size, region, and type of farm. The ARMS surveys are collected in three phases. The initial phase, or screening survey, collects general farm data such as crops grown, livestock inventory, and value of sales. Screening data are used to qualify (or screen) farms for the other phases. The second phase collects data associated with agricultural production practices. 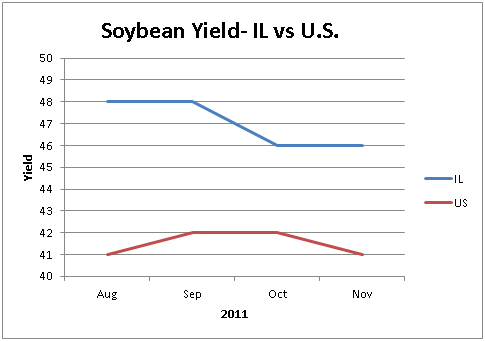 Commodities are surveyed on a predetermined rotation with up to five commodities surveyed in a given year. Farm operators provide data on fertilizer and nutrient applications, pesticide applications, pest management practices, and irrigation. The final phase, (Phase III) collects whole farm finance, operator characteristics, and farm household information. Operators provide data on farm operating expenditures, capital improvements, assets, and debt. In addition, operators report data on farm-related income, government payments, source and amount of off-farm income, and characteristics of their household. These data are used to gauge the health of America’s farm families and is some of the most sought-after information by policy makers.